UN Secretary-General António Guterres speaks at the University of Geneva, launching his Agenda for Disarmament, on 24 May 2018. The United Nations chief announced a bold new vision for global disarmament on Thursday, to help eliminate nuclear arsenals and other deadly weapons from a world that is just “one mechanical, electronic and human error away” from destruction. 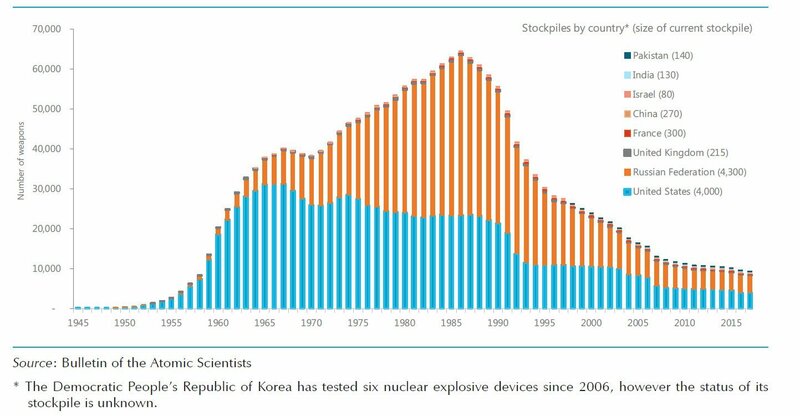 Global stockpiles of nuclear weapons. Second, he said disarmament of conventional weapons, which include small arms, light weapons and landmines, could “save lives,” in particular those of civilians who continue to bear the brunt of armed conflict. Third, he said that new technologies, when used maliciously, could help start a new arms race, endangering future generations. “The combined risks of new weapon technologies could have a game-changing impact on our future security,” he said. 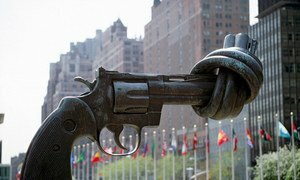 Disarmament – including arms control, non-proliferation, prohibitions, restrictions, confidence-building and, where needed, elimination – is “an essential tool to secure our world and our future,” said the UN chief. 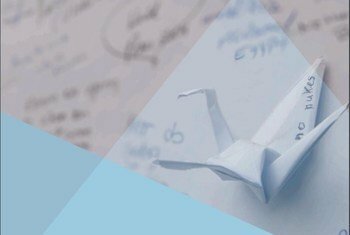 The cover of the Agenda, a 73-page document, depicts Orizuru, an origami paper crane. Its significance is that Japanese legend has it that anyone who folds a thousand paper cranes, will have their wish granted by the gods. In her hospital bed, Sadako Sasaki - a survivor of the atomic bomb explosion at Hiroshima in 1945 – folded more than a thousand paper cranes, praying that she would recover from the deadly leukaemia caused by the blast. She died at the age of 12, but her story spread around the world and origami cranes have since become symbols of peace. In the final paragraph of the Agenda, Mr. Guterres quotes the late Secretary-General, Dag Hammarskjöld, saying “in this field, as we well know, a standstill does not exist; if you do not go forward, you do go backward”. The international community must present a united front against gun violence which kills nearly 250,000 each year and injures many more, said a senior United Nations official on Monday, marking the start of a Global Week of Action Against the scourge.